I hope your microgreens sales are going well so far this year! If things aren’t going well, ask yourself WHY NOT? Today, I’m going to give you some quick ideas to tackle each of these issues so you can boost your profits and keep building a sustainable business. No matter if you have a large or small operation, you need to do whatever it takes to reduce your wasted product or your profit will tank and your business will die. talk to your accountant about the possibility of writing off your waste as an expense. turn your unsold market produce into samples to give out to chefs (as long as it didn’t suffer from going to market – ie. kept nice and cool, etc). You might be able to deduct this as “advertising expense” – again talk to your accountant. offer chefs the convenience of a weekly set delivery amount so they don’t have to take the time to reorder each week. Give them ability and process to increase or decrease order size for the next week. greens powders are all the rage right now in the health food world – so you might try dehydrating your unsold microgreens and put them in capsules or glass jars and sell them. Create a checklist for selling to chefs – I include this checklist in my online course, but you can make your own. Just create a process that you want to follow each time and try to keep improving it. Make following up a big part of your process. Also, ask for referrals and feedback. Make sure your branding and signage is good – create a beautiful logo and a bold, very clear sign advertising that you have microgreens for sale. Make it obvious!! I do sell a Branding Package if you are interested. Get your customers signed up for your email list – (this is way better than social media followers) so you can send them an email the day before market telling them about some special product you are bringing or deal you have going and that you can’t wait to see them. One great way to do this is by offering sampler packs in exchange for their email address. Educate people on how amazing microgreens are – They are in my opinion the tastiest, easiest, and most nutritious vegetables and herbs! If you believe that too, help your customers understand it as well. We’re talking flyers, cooking classes, samples, etc. 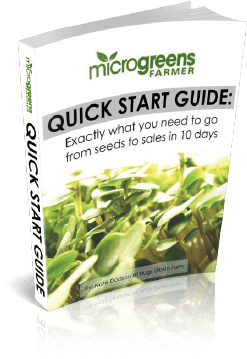 I get asked ALL THE TIME “how do I price my microgreens?” – and my answer is always the same: So that you at least make a good living growing and selling microgreens. This is really all there is to it. Determine how much you need/want to make per hour while you are engaged in this business, so that you are making a good living, then do the math to determine your minimum pricing. This is a challenging, not fun process to go through, but it’s ABSOLUTELY necessary! So for example, if you want to earn $30 an hour running your microgreens business, and you spend a half hour per 1020 tray of radish on average (from seeding, to sale, to clean up, etc) and your general overhead is $5 per tray (included supplies, seed, waste, electricity, taxes, insurance, and all other non-labor overhead), then you need to generate $20 on average from the sale of each of those trays ($15 labor + $5 gen overhead). Your overhead and labor might be slightly or vastly different for each of your sales channels (farmer’s markets, restaurants, etc), so be sure to calculate for each. At farmers markets with higher waste and full extra day of labor plus extra packaging time, it will probably be your highest pricing. For selling to restaurants, with fairly low waste, reduced packaging labor and materials, and quick delivery times, this will probably be your cheapest pricing. When you run these calculations, you are coming up with your minimum pricing. If there are very few competitors in your area, you can further adjust your pricing upward as the market allows. If you are in a very highly competitive market, you probably need to keep your prices nearer your minimum needed. I hope that makes sense! If you are not pricing your products properly, you are DOOMED! – so take the time to do the math and get straight on your pricing. I hope you have found all these tips helpful today and I hope you have an awesome week improving your business! Please let me know in the comments which of these suggestions you plan to implement first! I’d also like to invite you to get signed up for my free webinar – it’s jam packed with more helpful tips similar to what we’ve discussed today.